I posted on my private Facebook page last night about making breakfast burritos that you can make in large amounts, freeze, and then heat up for a quick breakfast on the go. As a result of that post a friend and also my sister asked for my recipe. So, this blog entry is for them. The trick to making these is to get everything ready in advanced. My husband and I worked on making them together, hot date - I know, and it was smooth sailing. Task 4 - Crack all 18 eggs and scramble eggs in large skillet. How you scramble is up to you. My husband puts a little milk in with them, I usually do not. The eggs taste fine, and freeze fine, either way. Be sure to also salt and pepper as your cooking. Add in onions and mix well for distribution. Task 5 - Prepare a space on your counter or table and lay out your tortillas. We have little space so we had to do just 5 at a time. Task 6 - In the center of each tortilla, layer your ingredients: Egg, bacon, cheese, & salsa. Wrap your burrito by folding over two opposite ends and then roll tightly. FYI: If you tortillas start to crack or crumble when you are rolling them. Take the whole thing, ingredients and all, and warm in the microwave for about 10 seconds. This will soften it for easier rolling. 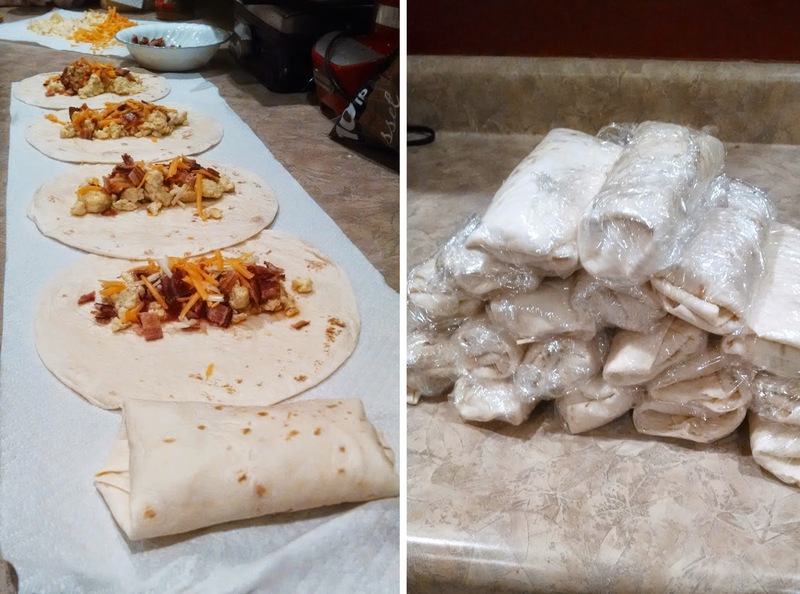 Task 7 - Wrap each burrito, individually, in Saran Wrap. Then place them in your freezer. Simple, right! It took us about an hour total with prep and cooking time. To heat up: When you are ready to eat, unwrap from plastic wrap and roll the frozen burrito up in a paper towel. (Do Not cook them in the plastic wrap. It will make your tortillas rubbery) Cook on high in microwave for 1-1/2 to 2 minutes. You may have to experiment with the warm up time though as each microwave is different. We've loved having these on hand. We never seem to have enough time in the mornings to eat so these are great for the convenience side of things, plus I like how they taste. 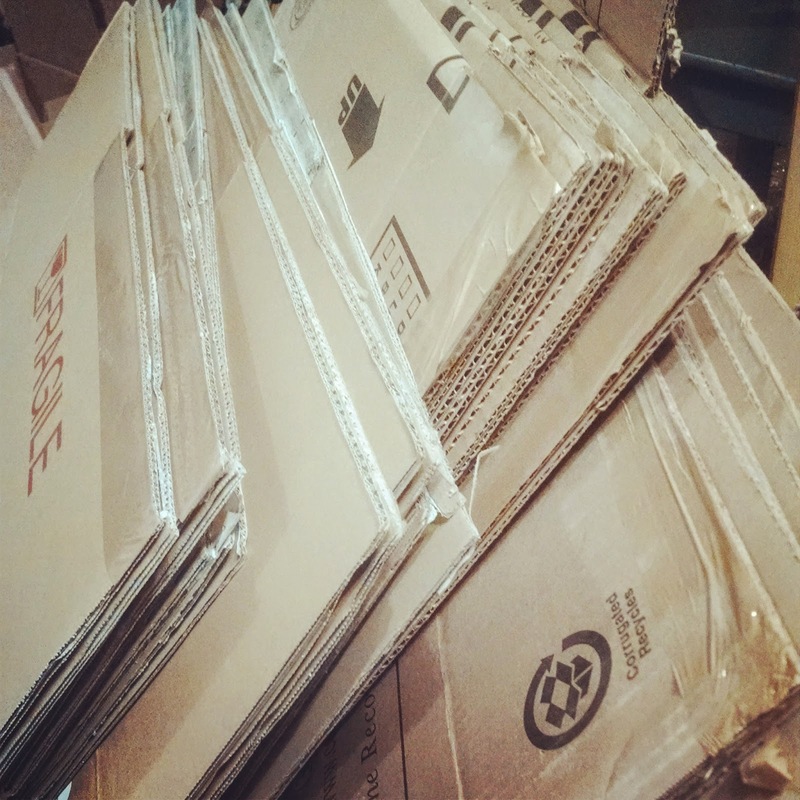 We are knee deep in the middle of a move. I'll be back on a regular basis soon! These are brilliant - perfect for after-school snacks as well as breakfast. I like that they can be eaten on the run by 'certain people' that are often lagging in the morning. So much better for them than the commercial versions.